In 1960, the Swiss artist Jean Tinguely was asked to build a sculpture to be installed in the Sculpture Garden of New York’s Museum of Modern Art. In collaboration with other artists and engineers, he constructed the self-destructive machine Homage to New York, which operated for 27 minutes during a public happening. It was an homage to the energy of a city that keeps recreating itself. To commemorate the 50th anniversary of Tinguely’s action, the Museum Tinguely in Basel and the Swiss Institute in New York will mount a group show entitled Under Destruction, presenting today’s aesthetic potential of destruction. 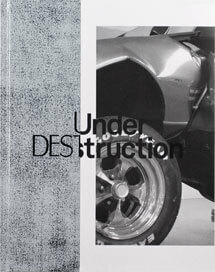 20 international artists investigate the role of destruction in contemporary art. Reflected from different angles, destructivity can be anything ranging from a creative act to a memento mori of the environment, from prosperity trash to a poetic transformation. Fifty years ago, the focus was the vision of an apocalypse through atomic wars. Today, the many different works are primarily inspired by critical evaluations of consumerism and surplus production.